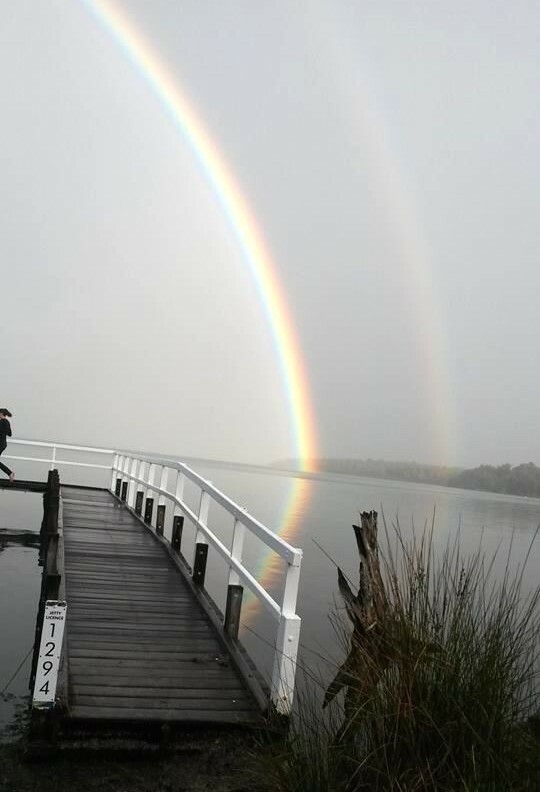 Yesterday at our Kuan Yin Day gathering (thank you to the lovely women who came along and shared their beautiful energy and heartfelt stories that made the day such a nurturing time together), fellow pilgrim Anette shared a story about this wonderful photograph she took on Saturday of a full double rainbow across the Mandurah Estuary. Anette had been driving home when suddenly, after a cloudburst of rain, this glorious rainbow appeared: it was a full arch with a double rainbow that reflected in the still waters of the estuary. It was so breath-taking that she parked her car and got out and just stood there in awe of this beautiful scene. Then she snapped this photo before getting in her car to continue on her way home, feeling a sense of elation at having been witness to this special moment, even though she was unable to capture and share the full radiance of the experience in a single photograph. A moment later, as Anette drove away, clouds blew in and the rainbow disappeared, just as suddenly as it had appeared, but the feeling of awe and elation remained long afterwards. I think it is very significant that the place where Anette “just happened to stop” was Warrungup Spring, the Aboriginal sacred women’s site where women had given birth to their babies for thousands of years (I wrote about Warrungup Spring in Sacred Places). It is a wonderful blessing to be present in a sacred place and to bear witness to a glorious moment in nature. Sacred places are physical spaces within which there is a higher potential for spiritual transformation: perhaps this is because we know that it is “sacred,” which brings our awareness more fully to the experience or perhaps there is a deeper mystery present at an energetic level that permeates our being. Although the reasons for sensing the sacredness of a physical location remain a mystery (and instead of intellectualising about why this place is sacred), it is most important to bring our complete awareness into the body, into the heart, into the mind and simply open ourselves fully to the experience of the sacredness present in that place. You can do this by relaxing your body and bringing your awareness into your feet connecting with the ground, drawing up the energy of the earth, feeling it streaming throughout your body; then bring your attention to your breath: gently following the breath in and out; breathing in the sacred energy of this place, breathing out and sharing your own energy, leaving the traces of your own sacred nature to add to the energy of this place. If you know of places that are considered sacred, it is important to visit those places with a meditative awareness – breathe, meditate, walk through these places and open up to receive its blessings and offer your own prayers, leaving your own spiritual footprint for the next pilgrim to find and follow. Likewise, when you witness beautiful natural events such as rainbows, sunsets, moon rises, or share precious momentary encounters with native birds and animals, there is a moment of awe in which you are completely open and one with that experience. In that moment, all your cares and worries and preoccupations are suspended while you share in that connection with something greater than just “I”. It is in that moment when spiritual transformation is possible – you are open and momentarily there is no separation between what is ‘inside’ you and what is ‘outside’ you: there is just being completely within the experience itself. Just being the experience of the rainbow. Just being. This entry was posted in Beauty, Inspiration, Spirituality and tagged beauty, rainbows, sacred sites, Warrungup Spring. Bookmark the permalink. Thankyou Cate. You certainly have captured my true feelings of this moment with the rainbow. Was a very special experience. I live probably a kilometre down the road from that site. I feel this is also a very special place. Sacred or not, I am not sure, but we feel very blessed everyday that we are here. Thanks Anette for sharing your photo and story – that’s wonderful that you feel blessed to live there – I too feel this whole area has a sacred energy. 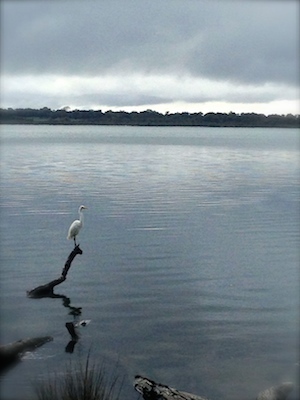 A beautiful rainbow and a beautiful egret. I’m soaking up the lovely images. It’s almost as if Anette found (just for a moment) the little pot o’ gold. What an exquisite photo Anette. Reminds me of when I was little and used to run across paddocks so that I could ‘stand in the rainbow’. I knew there was really no pot of gold…just needed to stand in the energy perhaps. Now I head down to ‘the Magic Beach’ here at Watermans Bay…coincidently also known as an ancient place for Aboriginal women and children. I paid this sacred space a visit this afternoon. And was blown away by the surrounding peace and beauty! I’m so grateful to now be aware this special place, I am sure to return to it as often as possible. Thank you Cate and Annette for introducing me to it. Since being there, I found myself completely relaxed, detached in a serene kind of way and aware. I look forward to taking this feeling into my dreams tonight, and may it stay with me for many more days.